In another article, I have presented a review of the Kronos BPWC2 6x30 binocular. Here, I want to report on my experience with the larger 8x40 member of the product line, which also includes a 7x35 and a 10x50 device. 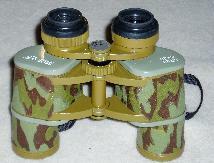 The general features of this binocular are identical to the 6x30: Aluminum body, wide angle oculars, a central focus which feels a bit loose (but this time, at least, there is no play), and a camouflage painting. 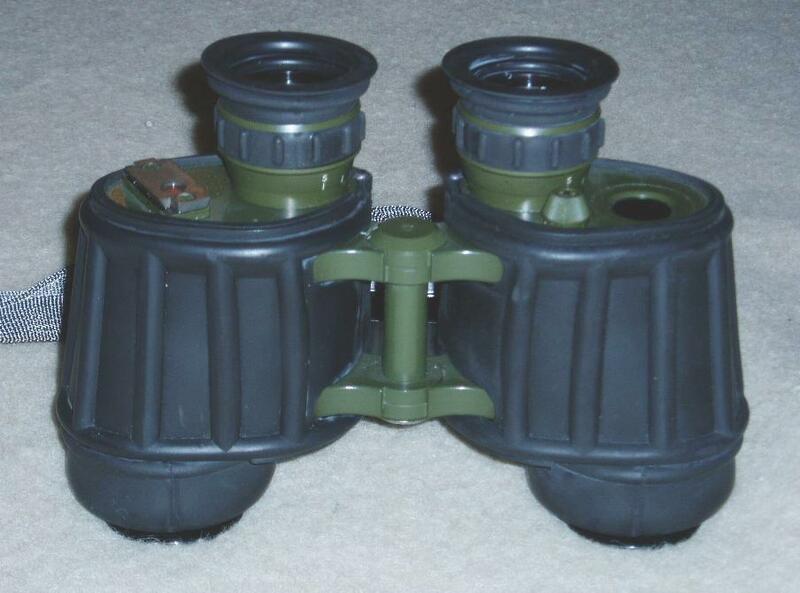 Apparently, the oculars and the prism housings do not differ from the 6x30 model. The eye relief is 17 mm but the hard-rubber eyecups are rigid and can not be pushed in for use with spectacles. The Kronos has got no reticle. It may be worth mentioning that, in contrast to the 6x30 version, the imprint on the right hand side prism housing does not read 'Kronos', but 'polje zrenija', meaning 'angle of field'. 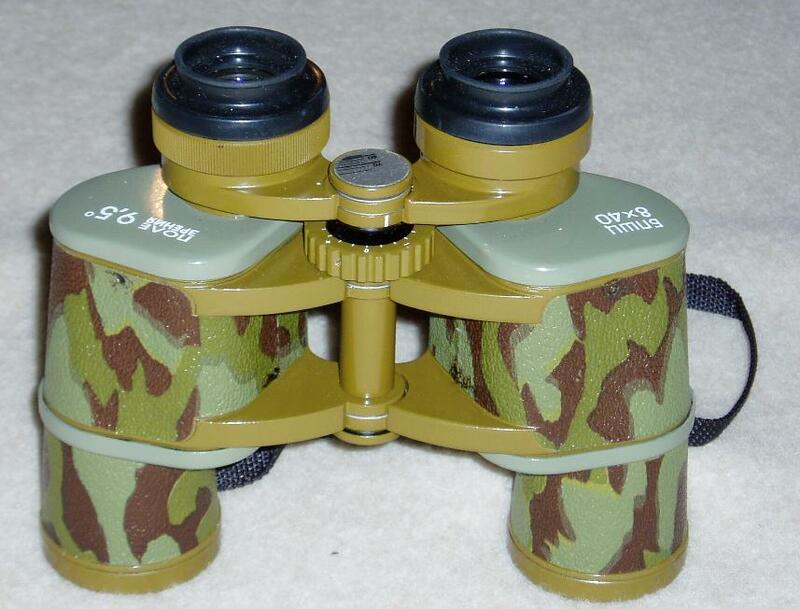 This binocular can be purchased at www.sutter-gmbh.com/ for 70 Euro. 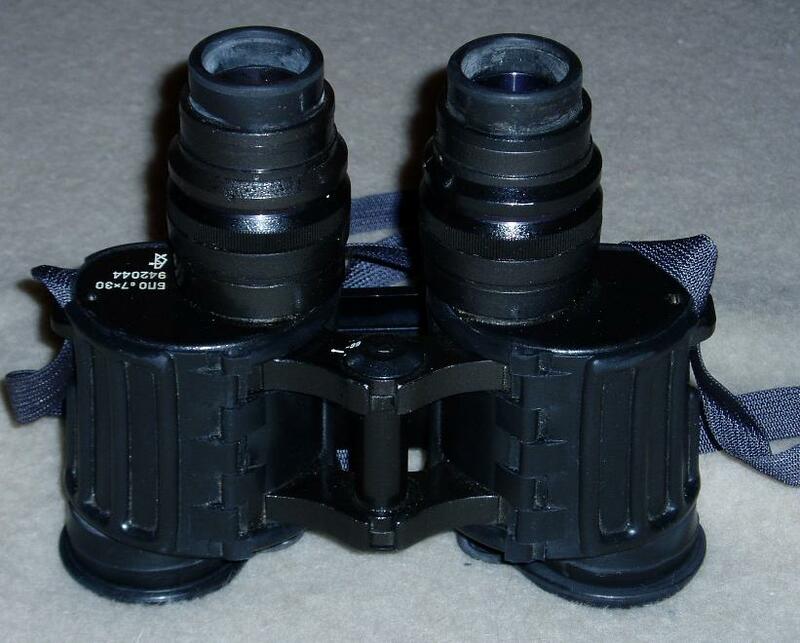 As usual, I have selected 2 other binoculars with similar specifications for a competition. The Kronos is advertised as a military grade device for sky surveillance. Therefore, I have chosen 2 contenders which are well known to be excellent military glasses: The East German NVA DF 7x40 and the Russian BPO 7x30. The NVA DF 7x40. Right photo: On the left prism housing, the window for the IR detector is visible. On the right hand side is the adaptor for the reticle illumination. The DF was produced during the 1960s and 1970's by Carl Zeiss Jena for the East German army 'NVA' (Nationale Volksarmee). 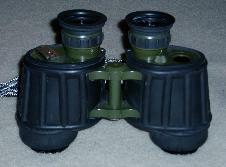 It is regarded as one of the finest binoculars made in Jena. It is featuring an extremely sturdy and heavy body, a reticle which can be illuminated by a battery powered device and a detector for active infra-red sources, which is charged by the UV contribution of the daylight. There are yellow filters (for use under hazy weather conditions) attached to the inner side of the ocular-cover. 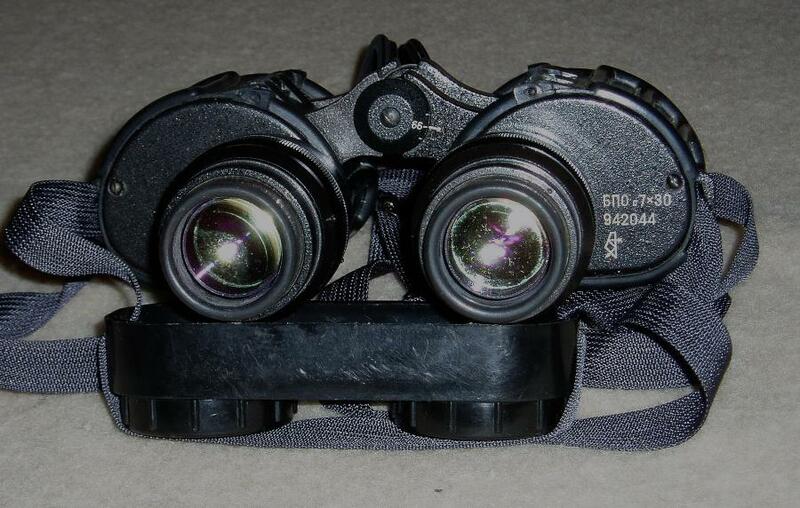 The eyecups are made of soft rubber and fold in so that the binocular can be used with gas-mask. It can be purchased in almost new condition on e-bay for about 200 Euro, which appears too less for such a fine binocular. In another review, the DF is compared against the Zeiss Jenoptem 7x50W and the Docter Nobilem 8x50 B/GA. The KOMZ BPO 7x30. Most impressive are the oversized oculars. The serial number indicates its production year (1994). The prism symbol is the logo of the KOMZ plant. The BPO is produced at KOMZ (Kazansky Optiko-Mekhanichesky Zavod) in the Autonomous Republic of Tatars. 'B' stands for binocular, 'P' for Porro prism, and 'O' stands for individual focus oculars. 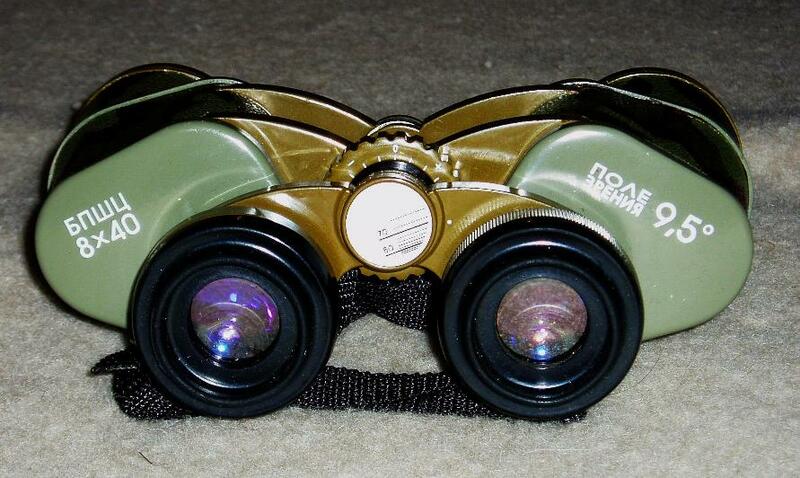 It is featuring a pair of impressive oversized oculars with internal focusing, i.e. they neither move nor turn when focused. Fantao provides on his highly recommended Binofan web-page a detailed description of this sophisticated 7-lens eyepiece construction. The rubber eyecups screw in for use with gas-mask. There is a reticle in the right hand side which cannot be illuminated. Impressive is the extreme sturdy metal body which is not only water-proof but promises a reliable functioning at temperatures as low as -40 degrees Celsius. The BPO comes with yellow filters attached to the ocular-cover. With only 30 mm aperture, this binocular has smaller objectives than its competitors. Isn't it questionable to compare 30 mm glasses with 40 mm glasses? In fact it is, since the total amount of incoming light differs by as much as 80%. On the other hand, the BPO is so large and heavy that it just doesn't seem to fit into the division of 30 mm binoculars. After all, this test is also a chance to address the question whether the tremendous weight of the device is reflected in a corresponding performance. The BPO 7x30 can be purchased new for 122 Euro at www.lekon-service.com. (It seems that in recent years clones of the BPO 7x30 have reached the market. Among other modifications, these models seem to lack the screw-in feature of the eyecups, are of less weight and also, at least some of them, of less quality. I got my BPO on e-bay and therefore I don't know of which quality the models at Lekon-Service really are; they confirmed that their BPOs were ordered straight from KOMZ). Angle of view: All glasses are wide angle. I could verify that all three of them have got about 8.5 degrees of real angle, which yields an apparent angle of 60 degrees for the DF and the BPO, and a pretty wide 68 degrees for the Kronos. Image sharpness: The BPO is the star! All through almost the entire field, the BPO offers a razor sharp and crisp image. Some degradation is discernible only at the outermost 10% of the field. In the DF and the Kronos, a similar aberration shows up already in the outer 25% of the field. If you think your binocular produces a sharp image, then compare with the BPO and you may reconsider your first impression. Similarly, at the night sky the BPO offers point-like stars throughout most parts of the field. The DF and the Kronos show point-like star images within the inner 60% of the field with a gradually increasing distortion toward the edge. With its large apparent angle of view, however, the Kronos leaves a good overall impression. Image color: The DF is almost neutral in color, with a very light yellowish tint. The Kronos shows a stronger yellow, but it is grossly outperformed by the BPO with its strong yellow image color. On a scale from 0 to 10, where 0 means neutral and 10 a complete yellow saturation, the DF may get 1 point, the Kronos 3, and the BPO 7 points. Fantao has dismantled the BPO's ocular and found a particular, single yellow lens element. This in fact indicates that probably a special glass type with exotic specifications (e.g. using rare earth or lanthanide additives) had to be employed for the ocular design. Rectilinear distortion: The BPO does not show any rectilinear distortion, i.e. straight lines appear straight all over the field. 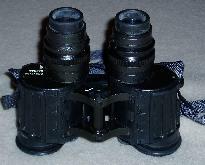 Most binoculars intentionally employ a slight amount of pincushion distortion to eliminate the globe effect with the panning binocular. Consequently, the BPO is showing such an effect, i.e. a characteristic convex curvature of the image while panning. Hans Seeger, in his book 'Fernglaeser und Fernrohre', points out that binoculars for naval use were sometimes designed without pincushion distortion, because here it looks particularly odd when the horizon is bending up and down while moving the glass. Therefore it should be pointed out that the presence or absence of pincushion distortion is no indicator for the quality of the binocular, but it reflects a particular design strategy. Stray light: When there are bright sources of light outside the field of view, some light can enter through the objective lenses and illuminate the inner wall of the tube. Part of this illumination can be reflected into the optical path and enter the eye as stray light, reducing the contrast of the image. Here, the DF performs best, and there is almost no indication for such an effect visible. In the BPO, under certain angles, some stray light can enter, and in the Kronos this effect can become disturbing. It is caused by the somewhat glossy finish of the inner tube. The intensity of the stray light in the Kronos 8x40 is little more than observed earlier in the Kronos 6x30 review, i.e. it is not too bad, but in the present test the competition is tough so that the Kronos is falling a bit behind. Ghost images: If, at night, a bright object (street lantern, moon) is positioned into the field, reflections on the air-to-glass surfaces take place, which can lead to multiple 'ghost' images of the light source. Here, the Kronos gives a good impression, with very little tendency for ghosting. The DF is similarly immunized through the left tube, but on the right hand side there are reflections on the reticle, which is apparently not well coated. The BPO is prone to ghost images on both sides. It seems that here we have to pay for the extremely complicated eyepiece construction with its numerous air-to-glass transits. Again, the right hand side with its reticle is a little worse. Low light performance: The three binoculars perform exactly as expected from their exit pupil diameters: With decreasing day light, the image of the BPO is the first one to turn flat as a result of vanishing surface details. It can be clearly observed how the DF still gives a 3-dimensional impression of the scenery when the BPO just shows some patches of different brightness without any apparent mutual distance relation. This is not a deficiency of the BPO but the natural consequence of its smaller aperture. The Kronos's twilight features come quite close to the DF's, but the fact that the Russian glass is more prone to stray light is of some relevance here: The sky is still brighter than the fields and glare from the tube, projected to the outer edge of the exit pupil, starts entering the eye's pupil which is, at lower light, growing in size. The contrast of the Kronos's image is therefore reduced and this is the main reason why it cannot match the DF's low light performance. With an exit pupil of 5.7 mm, the DF's little residual stray light is gone once it is dark enough for the eye's pupil to surpass this diameter. At the night sky, however, I prefer the Kronos because of its wider apparent angle of view and absence of reticle. Which binocular is better? This is so difficult to answer because the characteristic features of them differ a lot. One may be tempted to set up a table of features and distribute points, where the highest performing glass gets 3 points and the lowest gets 1 point. In case several binoculars are ranking equally, their scores are averaged. The final score suggests that the DF is somewhat ahead of the Russian competitors and this may be, summa summarum, correct, because it really has no weak points. Such a score is misleading, however, because it can't take into account the intentions of the user: You want to take out the glass for trekking in the mountains? Then the 1.3 kg of the DF could be prohibitive. You want to take it on your boat for sailing? Then the Kronos is useless because it is not waterproof and the salty atmosphere would corrode the aluminum body. The BPO's yellow image is disturbing for bird watchers, but if you like to carry out architectural studies then it is perfect because of its angular fidelity and sharp image. The NVA DF is a perfect example of a well balanced design. All potential problems are taken care of. In contrast, the BPO follows a different design philosophy: Efforts were focused to obtain a highly corrected image without any angular distortion. The resulting device has to pay for that with a yellow image (due to exotic glasses in the ocular construction), some glare (due to large number of lens elements) and a weird panning behavior (as a result of the globe effect). The Kronos could be easily improved with a better stray light suppression. Some more baffling and a better finish of the inner tube are moderate modifications which would erase the weakest point of its optics (in fact, the larger 10x50 version, with its longer objective tubes, is suffering even more from the same defect). This done, a few minor improvements in the construction, e.g. 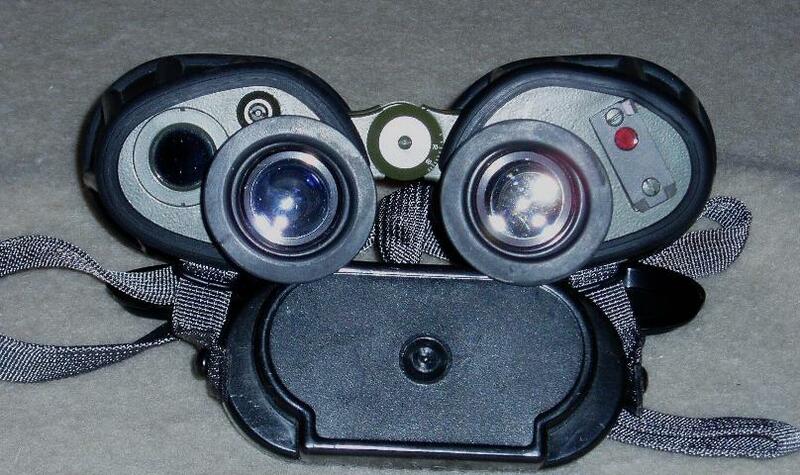 fold-down eyecups and a solid central focus - or, why not individual focused oculars? - would allow the Kronos to compete with the high end line of binoculars of its class which cost a multiple amount of the Kronos's price. In conclusion, considering their performance and also their price tags, all three binoculars are bargains, and I won't hesitate to recommend any of them to anybody looking for a low magnification, medium sized, wide angle binocular in the medium price range.